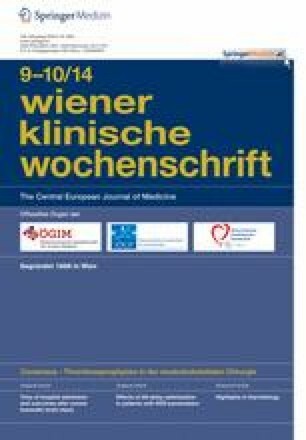 A 38-year-old woman was seen at the Department of Dermatology, Medical University of Graz, after complete excision of an ulcerated nodular melanoma on her left shoulder. She had observed first symptoms of lateral growth, itching, and recurrent bleeding of a congenital nevus over a period of several months. Histopathological examination revealed a tumor thickness of 1.08 mm. Staging assessments, including tumor markers, echocardiography, whole-body computed tomography (CT) scan, cardiac magnetic resonance imaging (cMRI), and positron-emission tomography (PET) scan, revealed no further lymph node involvement or distant metastases. The sentinel lymph node was tumor-free. Despite the urgent advice of adjuvant interferon therapy for 1 year, the patient declined this treatment. The online version of this chapter (doi: 10.1007/s00508-014-0518-4) contains supplementary material, which is available to authorized users.